The Original Sound Amplifier. With this device, you can magnify faint or distant sounds with a clarity you never thought possible. Detect animal movements for nature observation or photography or direct microphone toward a distant conversation for surveillance or personal safety. 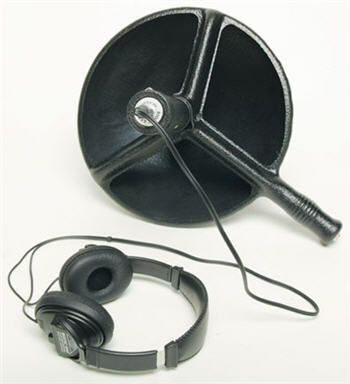 Record bird calls and other sounds with the recorder output jack located on the microphone. Increase sound by up to 30 decibels using an omni-directional microphone, a solid-state amplifier and high fidelity earphones for concert-hall quality sound reproduction. When combined with the optional parabolic Bionic Booster, the Bionic Ear becomes highly directional, allowing you to easily locate the source of sounds and suppress background noises. Naturalists use the Bionic Ear and Bionic Booster to locate many more birds and animals than by sight alone. Allows you to see and hear things that went unnoticed before. Pinpoint sounds and their direction so you can move in close. When used with your recorder, the Bionic Ear and Bionic Booster will help you make fabulous recordings to keep or give away as gifts. You'll be amazed at the clarity and quality of the sound. Search & Rescue Teams use the Bionic Ear and Bionic Booster to aid in locating people lost in rough terrain. Hear movement and human voices at great distances. Loud sounds are not amplified. The automatic safety circuit is activated and the Bionic Ear momentarily shuts off when the amplified sound reaches 95 decibels. Operates on one 9-volt alkaline battery (not included). Available in: Black only. Note: This is a line of sight device. It can not hear through walls or windows. NOTE: ALL SALES ARE FINAL ON THIS ITEM! NO RETURNS OR EXCHANGES!